A developer is looking for residents in Warwick to have their say on emerging proposals that would see 150 homes built in the town. Developer Crest Nicholson is anticipating that it will be submitting plans for homes in Montague Way in the near future. The proposals for 150 homes in Warwick. Image by Crest Nicholson. Crest Nicholson is holding the public consultation prior to formally submitting plans to Warwick District Council. The site, which is located between Montague Road and the Grand Union Canal, is made up of land and buildings that were part of the former Ridgeway School and buildings that are currently used by Warwickshire County Council as a depot. Crest Nicholson has said that it will be working with the county council – as it owns the site – for the application. The website also says that planned access to the development would be through two points off Montague Road in similar locations to the existing ones. It also says that there will be a dedicated pedestrian and cycle access. 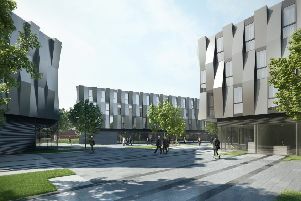 Crest Nicholson said that there would be an ‘open space link’ running through the centre of the site, which would connect Montague Road to the canal towpath. The ‘open space link’ would feature a mix of plants and trees. Residents are being asked for their comments on the proposals and anyone wishing to submit views should send them to montagueroad.warwick@gva.co.uk before the consultation deadline on noon on Monday, January 21. Alternatively comments on the proposals can be submitted to the developer by post. The address to post comments to is: Montague Road Consultation, c/o GVA Planning Department, 3 Brindley Place, Birmingham, B1 2JB. It is not yet known when the plans will be submitted.